"What is team building and how can it help my business?" You must draw on language, logic and simple common sense to determine essential issues and establish a concrete course of action. Many frustrated leaders finally ask themselves this question only after their wit's end. This question should be the first step every leader takes when establishing a new team or redeveloping an old one. Many business people spend half a decade in business school learning this fact. But in the real world, we rarely ask the question. At the core, team building simply means organizing and building a culture and community of kindred spirits; individuals assembled for a common purpose or goal. This simple concept often lulls people into thinking that building a team is simple too. On paper, team building looks simple. But most companies and organizations lose sight of their effective team building effort and get into the realm of opinions on teamwork. So how can organizations and companies improve teamwork systematically, using important teamwork principles? What is team building, and in what situations can you use it? Teams can be built for darn near anything: building a sports team, military squads, marketing teams, invention companies, neighborhood watch, environmental watchdog groups, quality improvement teams. . . you get the idea. Anywhere difficult problems need to be solved, teams can (and should) be built. The power of teams lies in their promise of greatness. The promise is huge. What if you had a well-oiled team that not only met every objective, but blew it out of the water? 26% sales above your team's target number? 43% better customer retention rate than the industry average. A 450% decrease in workplace accidents. Great teams make things happen! 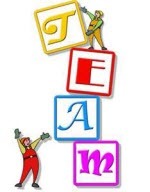 Real situations with real results - teamwork in action, just by harnessing the power of a focused team. Great teams focus on each individual's strengths while hiding their weaknesses in the strengths of others. 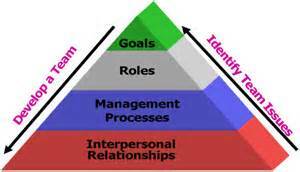 As a team leader you facilitate your team's cohesiveness and urge the entire team forward to achieve the lofty goals. On paper, building teams seems logical, simple and effective. BUT, if team building is so simple and effective why does it fail so often? Teams don't live on paper. And, as the complex creatures we humans needlessly complicate things. The things we don't complicate - we tend to ignore entirely. Empowering Your Team's Success Starts With You. . . The easy answer: responsibility for your team's success lies with you - the team leader. You conceived the idea, set the objectives, put the team together, and managed your team until their failure became as apparent as the nose on your face. Right? Sure, many teams never reach their potential. Many teams end up as marginally effective, bickering, back-stabbing swarms of non-team players. Or worse yet, end up totally ineffective alcoves of angst ridden corporate infighters. The main reason for these utter failures occurs because most people never ask themselves "what is team building?" before setting out to build their team. We put The "team" together with the dysfunction built into it. . . You doom the team before it ever takes the field. Because most leaders never get around to asking themselves "what is team building?" until their team fails so miserably that jeopardizes their job or their life. The more difficult answer: everyone takes responsibility for the team's success on a team built for greatness.